Playing a big part in this of course were our good friends from the Dubai Culture & Arts Authority (It was a delight to catch up with Bilal and Yasser after a long break). After much struggle looking for signs to the Mamzar theatre, diva breathed a sigh of relief in discovering that the said theatre where the performance was going to happen was part of the Dubai Culture and Scientific Association building (I can be so ‘duh’ sometimes). 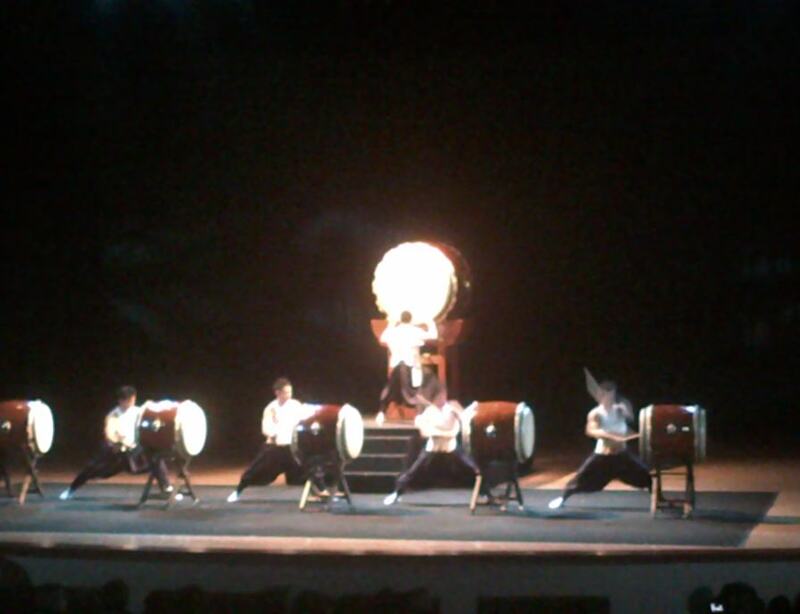 But it was worth the drive for the captivating performance titled The Taiko Legend – Heart Beat from Japan. Hayashi led the Taiko Group to perform ‘The Taiko Legend’. An acclaimed musician, Hayashi is ranked as one of the world’s leading taiko players and a foremost cultural and artistic asset of Japan. His performances range from tranquil to inspirational offering an unparalleled experience for the audience. People who have lived in Asia may have come across Kabuki before. Until the first part of the 20th century, people in Japan used to play Taiko early morning on the performance days of kabuki theatre. If you have not seen this before, put in on your bucket list for traditional entertainment. I was suitably impressed by ‘Mitsumai’ (Three Dances) composed by Eitetsu Hayashi. A motif, reminiscent of matsuri bayashi (Japanese folk-festive music) is the basic phrase of this piece. The piece also featured the characteristics of Shimedaiko (this has a high pitched tone compared to other drums) and had the vital structure of a Taiko ensemble piece. I was told by my Japanese friends that Shimedaiko is traditionally accompanied with other instruments such as the vertical flute and mini tampani to make festive tunes for Japanese street festivals. Out of the 6 main pieces, the one above was my favourite although the solo performance on the Japanese bamboo flute (Shakuhachi) came close. Ranging from traditional, to the contemporary and experimental, this simple instrument makes audience feel the beauty of sound and depth of expression. As the Emirate’s dedicated Authority for culture, arts, and heritage, its awesome to see that Dubai Culture is just as dynamic & committed to strengthening cultural exchange as before, as well as facilitating exchange of ideas by providing Emirati and local artists the opportunity to work alongside international artists. All in all, a fantastic night out in terms of diva being being a culture vulture.